Stay organized and efficient at home, work or in the classroom with wall-hanging document organizers from School Savings. Whether you've got a house full of kids, a bunch of projects going on at work, or a classroom that needs to run efficiently, staying organized is not only essential to your success but sometimes your sanity! That's why we created the durable and convenient School Savings Hanging Document Organizer , a versatile hanging file folder system that lets you safely and easily store important documents and files within reach. So save room on your desk; keep papers more organized, and reduce the stress in your life. Get the School Savings Hanging Document Organizer and stay one step ahead of life, work and everything in between. Stay more organized and efficient by clicking 'Add to Cart' above and getting our wall-mounted hanging organizer! Convenient Organization - Keep your home, office or classroom organized with our hanging storage that holds letters, bills, files, classroom supplies or forms. 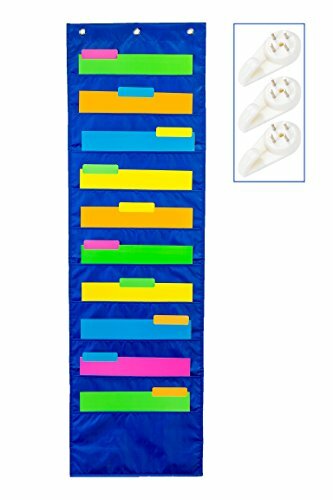 Deep Pockets - These hanging file organizers store letter-size folders and paperwork measuring 13.5" x 7", making them perfect for professional work. Saves Space, Time and Effort - A premium file organizer, eliminate the need for bulky filing cabinets or large desks by utilizing unused wall space! Easy Installation - Thanks to three heavy-duty grommets it takes little effort and minimal tools to securely fasten these to standard dry wall. Adult & Kid Friendly - Parents, teachers and office workers will love the versatile organization, while children will enjoy storing their drawings, arts and crafts. If you have any questions about this product by School Savings, contact us by completing and submitting the form below. If you are looking for a specif part number, please include it with your message.